In between trips, we finally got our main couch delivered! When we first were planning to add a sitting area, we figured it’d be a regular couch against a different wall. 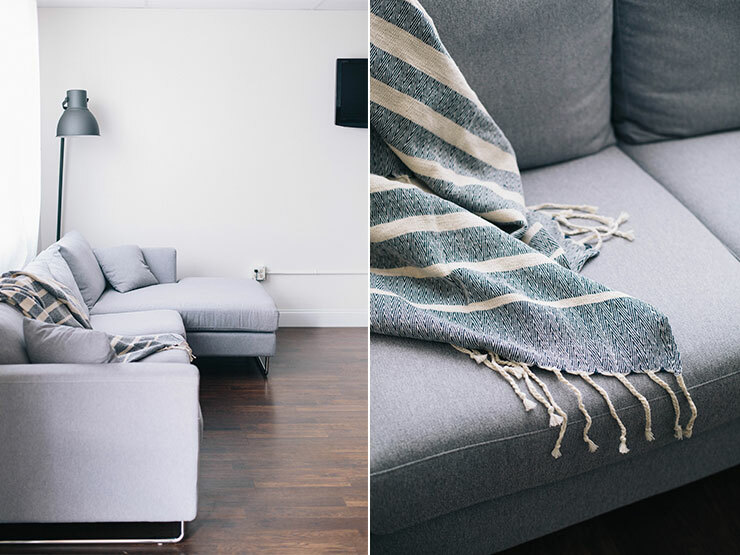 When we saw this couch from Interior Define, we knew we had to have it. We just weren’t sure where. Our studio is sort of this weird “L” shape and we’re still working on updates to the warehouse so that it can be a space to work and create with natural light. After moving some stuff around, we realized we really loved it against this wall with the window. We pushed the main conference table up and now there’s an amazing area where clients can relax, sit on the couch or at our custom table. I don’t talk about our business as much as I’d like, but we work collaboratively with local clients (or clients who come to work with us from out of town) in really intense bursts. We’re together for a minimum of 4 hours together but usually up to 8-10 hours. A post coming soon all about how we made our business structure work for us and our strengths. 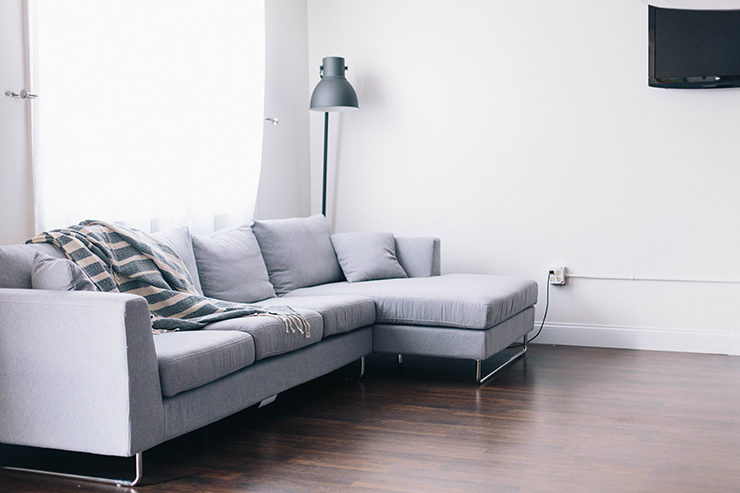 All that to say…sitting on those white chairs are great but after hour 5 you’d do about anything to sit on a couch. Now they can!! We have a TV mounted to the wall where all of us can get comfortable and work through revisions + concepts. So far, I’m really impressed with the couch. It doesn’t sink in after someone sits there and the chaise part it really wide (hello, afternoon naps). I’ve outlined some of the next things we’ll be adding below as a mood board. Once we’ve back in town, I’ll share the next round of updates! 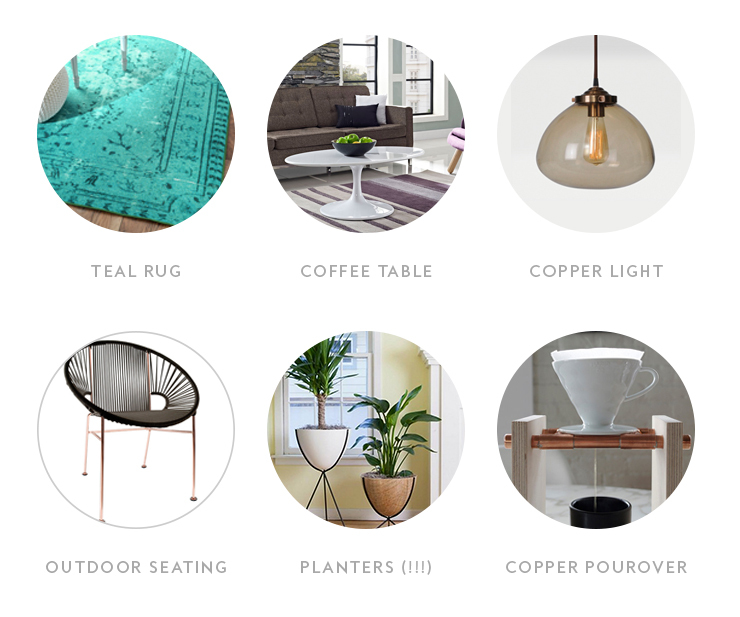 teal rug, coffee table, new pendant light, outdoor seating, planters and custom pour over stands from our friend David! Amazing style! 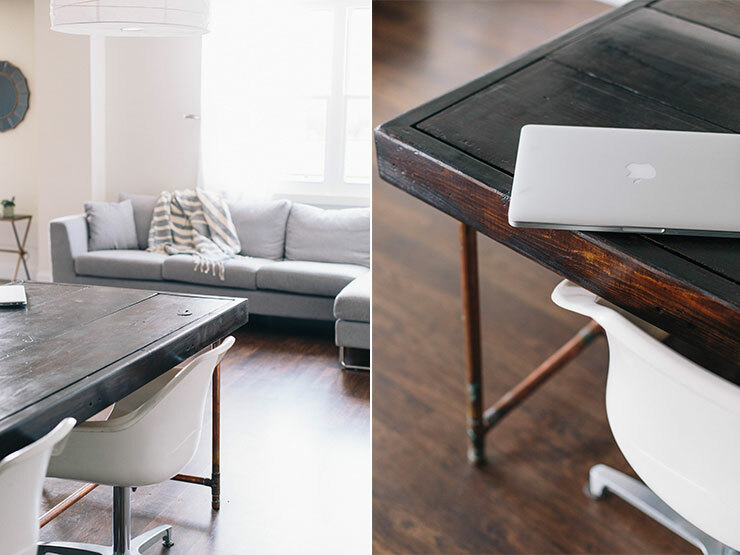 I’m loving that rustic/industrial table. I love that you found me! We didn’t grow up too far from each other. I will for sure email you once I’m back! Allie, I am SO loving this! 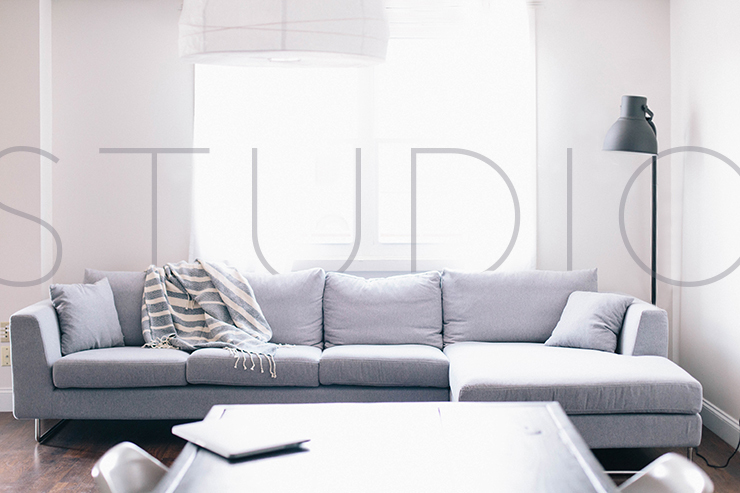 That grey couch and bright natural light makes the studio look so inviting. Also, I saw that teal rug online while shopping for my living room recently and LOVED it. I bet that is going to add some major funkiness to the room. I’m excited to see it! Thanks Melyssa!! I am so obsessed with that rug. They photograph SO well, too! So amazing, look like you like gray haha. Waiting next update! !